The fall foliage of a Star Magnolia Tree (Magnolia stellata) at Queen Elizabeth Park in Vancouver, British Columbia, Canada. During many trips to the “big city” I make a stop at Queen Elizabeth Park in Vancouver. 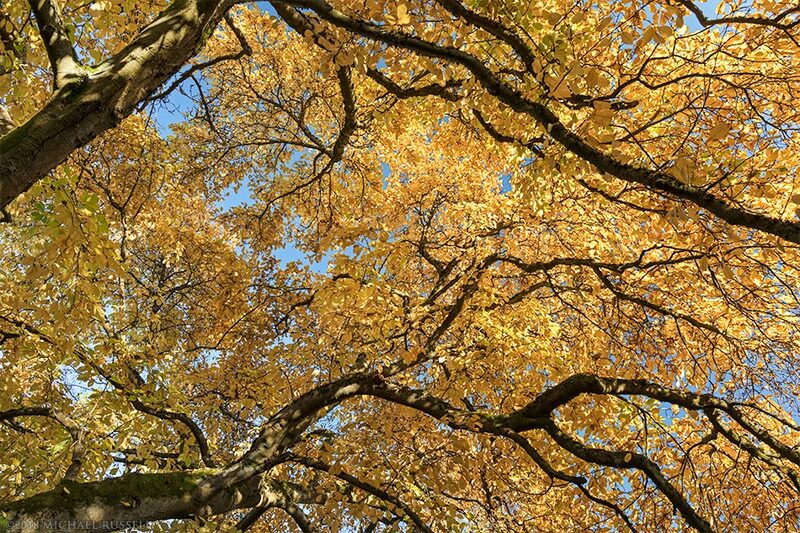 QE Park is located not far outside the downtown core and is a great spot for fall leaves in the gardens. On this stop I was particularly interested in some of the Japanese Maples, the Gingko tree (Gingko biloba), and a specific Star Magnolia Tree. Queen Elizabeth Park is one of many locations where I had decreased how frequently I make a photograph while visiting as I’ve photographed many of the scenes before here. Now that I have a higher resolution camera, however, I do find myself re-shooting some of my favourite scenes just so I’ll have a few extra pixels should a print or licensing order need them. Plus, there is always room for improvement or slight changes to a composition. The Star Magnolia tree above is one of my favourite things to photograph in Queen Elizabeth Park, and I was not disappointed with the fall foliage I found here in October. I’ve previously photographed the same tree, with similar compositions in early spring (flowering) and in the early fall. I’ve a few alternate compositions of the first photo in my Garden Plants gallery as well. Getting a winter photo with snow on the branches is going to be the tough one! 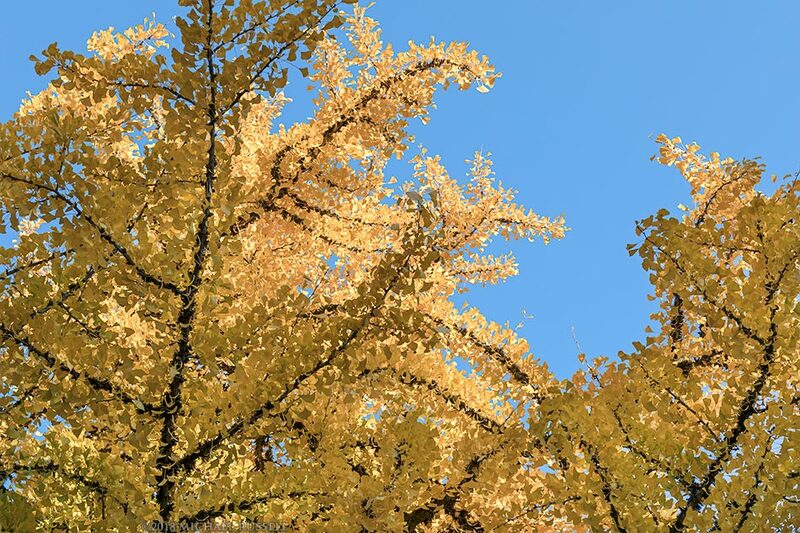 The Star Magnolia was great but the Gingko tree was spectacular with the dark yellow leaves in the sunshine. 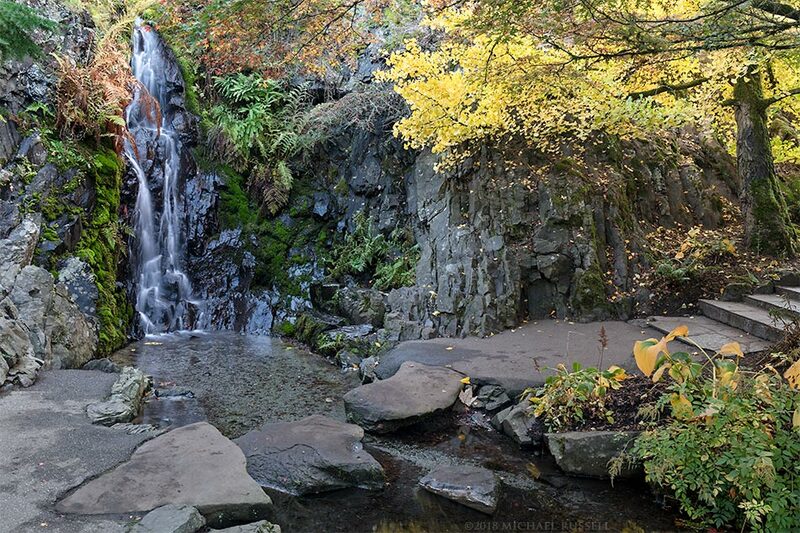 There were very few people around the Magnolia as it isn’t quite in the main area of the quarry gardens, but the Gingko is well known, next to a waterfall, and is in the main loop around the gardens. This means some patience was required to photograph the waterfall below, and to a certain extent the photos of Bloedel Conservatory as well. As I was waiting for around 10 people to move on from underneath the Ginkgo, I backed up and made this composition looking up at the leaves. It kind of reminds me of the paintings people do by dabbing sponges into a canvas. 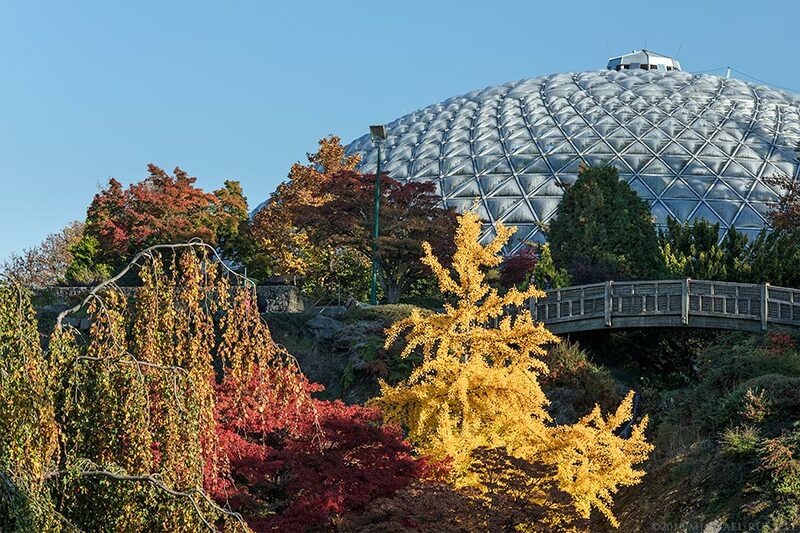 This photograph of the Bloedel Conservatory is a “iconic” view from one of the viewpoints at the west side of the quarry garden. I’ve photographed this scene on many occasions. My most popular photo of it is actually on a typical Vancouver day – grey and dreary. It was nice to finally photograph this location with blue skies and sunshine lighting up the fall leaves. Only the Maple trees denied me their full cooperation. Maybe next year! I’ve photographed this “waterfall” before (water is circulated by a pump) but it always looks best with some fall foliage around it. The Gingko provided some colour for this composition. For more photographs of Queen Elizabeth Park and other garden scenes please visit my Garden gallery.